Who wouldn't be skeptical when a man claims to have spent an entire weekend with God, in a shack no less? I had no idea what this book was about until I started reading it. I was convinced it was a thriller and boy, was I in for a shock. I am not sure whether I would have chosen to read it if I had been aware of the subject matter as I do not have a religious background and find it a difficult subject to read. This is the story of Mackenzie, whose youngest daughter, Missy was abducted during a family holiday a few years before the story is set. It was believed that she had been brutally murdered as evidence is revealed in an abandoned shack in Oregon, yet her body was never found. The story begins four years after the abduction, when Mackenzie receives a very suspicious note which appears to be from God. The note invites Mackenzie to return to the shack. 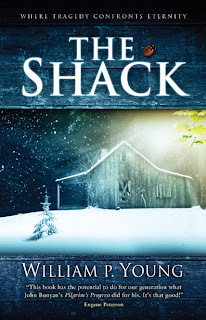 Mackenzie decides to return to the shack to see who is playing jokes on him. When he returns he finds that his world is about to change for ever. He meets God, Jesus and the Holy Spirit. On the back of the book there is the following statement, which I believe best describes this book. I found this a tough book to read, as I am more of a ' If there is a God' rather than 'Where is God.' type of person. I wish I had the beliefs of others and I hate to be cynical, but unfortunately this is me and I can't change. I watch the news, I watch how people suffer and I struggle to see how anything that could possibly stop it, would let it go on. However, I am aware, that a lot of book bloggers have strong beliefs and I respect them for that and they probably have personal evidence that supports their faith. I think this book is trying to make God hip, to make people try and see God as a fallible being rather than infallible as we all perceive him to be. The book gives the impression that he alone is not responsible for actions of the human race as they no longer listen to him. He has no real control over anyone, he can only be there to shield the suffering a little. That really is only my perception of what this book is about, so if anyone else has other ideas about what the book is trying to say, then I would love to hear them. I struggled to read about the abduction of Missy. I normally will avoid books like this and I do believe that is because of having children myself. Mackenzie suffers from an immense amount of guilt as he felt if he had not concentrated on his other children by saving their lives, he would have been able to save Missy. I felt very deeply for him and how he suffered and was pleased to read that what he saw and felt helped him to overcome his Great Sadness and move on with his life. I was under the impression from the way the book was written that it was actually a true story, yet there was no mention in the book that it was. Did anyone else have this feeling? If you have strong belief in God, then this book will reaffirm your beliefs. I enjoyed it, but probably came away with more questions than answers about my own beliefs. Definitely worth a read if you have questioned your faith. I have wondered about this book for quite some time. When I read a couple of different summaries I was a little skeptical about the story lineand not sure it was a book for me. After reading your review I think I probably will read it. I was raised in a religious, Roman Catholic home but as I grew up that made me questions things more than simply accept them. It sounds like an interesting perspective on God. I don't see the Catholic Church too happy about anyone seeing God as fallible. When I read it, I'll let you know! I've never heard of this book before, but it does sound somehow interesting! Thanks for your honest review! I haven't picked this one up because I did know what it's about and figured it's not for me. I do know it has been very controversial. I have strong belief in God and I thought this book was great. The abduction is very hard to read about, especially if you have children, but the build up of that event was necessary to get the impact the writer was working for later in the book, and I thought it was worth it. I like the way the author portrays God - the one thing I remember most about my religious education(if you can call it that) is that God gave us all free will, and with that comes the bad decisions that people make and therefore all the tragedy we have in the world. I hope people pick this book up, it does get your thinking. I think I'm probably a bit like you. Definitely like mommablogsalot - only recently I've been using the Agnostic label but again only then because someone in a conversation (argument) about religion said 'oh so you're an Agnostic' and I had to go look it up and it sounded about right. Saying that the book does sound interesting but again I don't like books where 'things' happen to kids. It probably is like you say, to close to home when you have kids. That's why I can read books about monsters and vampires and not blink an eye but books like Silence of the Lambs give me nightmares for months afterwards because they could really happen - they are the real horrors. Anyway, I remember that the first time I heard of this book was when Joanne at Book Zombie reviewed it. She wasn't too impressed with it, and I'm not sure if I'd be either. I'm glad you find it worthwhile despite the initial shock, though. I've been wanting to read this book, but I'm not a very religious person. The book sounds interesting, though. I read this book back in December or January. To be honest the book didn't make a big enough impression on me to remember what I really thought of it without rereading my blog. I'm a believer and a Christian, but I am very cautious of Christian fiction. It's probably my "literal" upbringing, but I'm hesitant to take it too seriously. I can also see how the child abduction part could be very difficult for you. Great review! I love reading reviews of this book because I think it's a pretty controversial book as well as a love-it/hate-it kind of book. I loved it. I guess because I don't think God's fallible or can't control what happens, but more of a "stepping back, free will" type of action. I guess kind of like a parent of who finally has to step back and let their grown child live their own life, whether they go they way you want them to or not. I thought your review was a great perspective and thought you handled reviewing a controversial book really well. Thanks! I was just looking at this one on Amazon and was surprised to see it had a religious theme. Great review! It does sound very good. I am Catholic & agree w/ you, Viv, it is so difficult watching the news & seeing so many people -- children & animals especially -- suffer! I struggle w/ God allowing all this pain to go on but I tell myself God gave us freewill & it is the choices humans make that brings about all this senseless tragedy. I have this book sitting in my tbr tote because I don't want religion shoved down my throat. I do read a buffet of everything but don't want someone's agenda hurled @ me. I mean, we read what we love & love -- or abhor -- what we read. Thanks, Viv, for your honest post!